Scene Point Blank: Thanks very much for taking time to sit down with me first of all. A lot of people who may be reading this are quite aware of the work you’ve done in The Broken Social Scene, but may not be as familiar with your solo work. For those who haven’t had the chance to hear it, how would you describe your music? Jason Collett: It’s more narrative than the sound circus that is the Broken Social Scene, and definitely in a more singer songwriter vain. I’ve always been into song writers. I’ve taken influence from artists like Bob Dylan, Patti Smith, Elvis Costello, Bob Marley, you know? That’s the basic difference. Well the Social Scene tries to take the form of a song and turn it inside out and upside down, I still am attracted to something that’s ultimately a traditional form. I’m pretty lucky to be able to have a foot in both worlds. I can get my freak on in an art rock band, then be able to retreat and satisfy that other side of myself. Scene Point Blank: You’ve been known to get more personal with the solo work obviously, and I’m wondering what does that do for you? 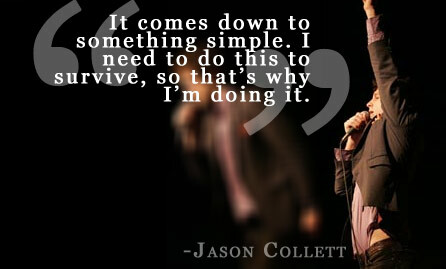 Jason Collett: It’s what I’ve always done. I think most people who are song writers, or performers, do it out of a certain need. It’s survival, really. If I didn’t write I think I’d do kind of crazy. It’s an outlet for me. It’s a form of expression, a form of communication. Writing songs is the fundamental for me. It’s the most important part of being a musician, and everything else comes secondary to that. When I joined the Social Scene I wasn’t looking to join a band. I had always intended just to focus on the solo stuff, but they’re all good friends and it’s very hard to turn down that good of a time. It’s been a bit of a juggling act doing both, and that’s why I’m not out with them right now. I’m focusing on the solo thing. It’s too much to do both, as tempting as it is with everything really going to the next level. I have to ask myself what the most important thing for me to do is, and when it comes down to it it’s this. It comes down to something simple. I need to do this to survive, so that’s why I’m doing it. Scene Point Blank: When looking through the liner your solo record you see a full gamut of the “indie rockers” coming out of Toronto currently. How do you react to being a major part of one the most talked about music scenes in the world? Jason Collett: It’s been a time and place thing. Ten years ago a Band like the Social Scene, or a band like the Dears, or Arcade Fire, any of us who have come out of the Canadian Renaissance of late…well without the internet to facilitate the global interest which has allowed people to listen to us this never could have happened. People have been allowed to find their small niches that they’re into. Its cut out the middle man of big label distribution, we don’t need it anymore. It used to be that you needed to be on a big label to be heard internationally. Indie rock has been able to break out in the last dozen years. We went to Europe and were playing sold out shows. We didn’t even have a release out there, but people knew. That could not have happened without the net. The other end of that is that there really has been this Renaissance coming out of Toronto, and Montreal, and really across Canada. It’s not just in music either; it’s in the arts, it’s in critical thinking. Toronto is a really exciting place to live right now. The tastemakers have decided there is new cities where it’s happening; now it’s Oregon, last year it was Montreal. Nevertheless, I’ve lived in Toronto my whole life. It’s been my home, and it’s never been as exciting. It isn’t just in music, it’s in everything. Canada doesn’t understand this about Toronto; but Toronto is like a small town. There are no big cities in this country; if you’ve traveled anywhere in the world you know that. Toronto has just begun to develop a real voice of it’s own, and it’s something really unique. That’s a part of the reason why we’ve had such success as a band: there are so many of us getting to live in this great city and bringing our experiences to the table. It’s hard not to be influenced when there is so much going on around you. Scene Point Blank: There is a lot more I’d love to cover, but you’re about to go on. Is there anything you’d like to add? 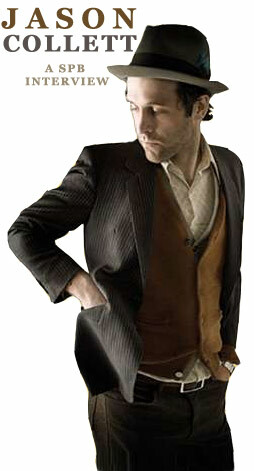 Jason Collett: I think I’ve said more than enough. Posted June 15, 2011, 2:10 a.m.
Posted April 20, 2010, 6:06 a.m.